Energy (en·er·gy) 1. 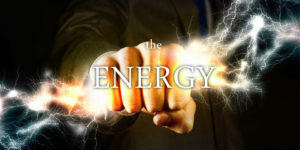 Energy exists in the physical form and is often referred to as universal life-force energy, prana, chi, or qi. Spiritual energy is the manifestation of divine pure love and, depending on an individual’s religion, that love comes from a deity, deities, nature, family, or an energy that defies description and explanation. It’s considered the life force that binds the soul to the body. In this concept, the soul is itself everlasting. Love is an energy that bonds all matter. Without love, all particles become chaotic and disorganized, much like you are witnessing with some world events today. With love, energy expands. With hate, energy contracts. Hatred can act as a catalyst to bring a person toward the light of love, unless a person chooses to hold the energy of hate by refusing to let go. Movement toward the light of love depends on motion; it cannot remain static. The magnetic nature of the Universe supports individual emotional expression within the structure of divine providence. Motion is provided by polarities that create oscillation, giving birth to light within resonant frequencies. When vibrational frequencies are disturbed, darkness follows within a distorted and disorganized energy. The result is an energy leak, like a balloon with a pinhole. Unable to hold true form, the structure of energy is lost as polarities weaken from the lack of alignment.